Okay, I know I'm being a little bit snobby here, but I just wanted to point out something I found a bit humorous. There's a new iPhone app called iAstrology [iTunes link]. Interestingly enough, there's a NASA logo that goes along with the app. I'm thinking, "Did the developer mix up astrology with astronomy?" Astronomy Picture of the Day is a feed created by NASA that let's you see what amazing depths of space that they are exploring. NASA does not even just give you a high resolution photo that you can navigate around using the iPhone. They also give you a detailed explanation as what you are seeing. Help support the USA and NASA by buying this application today. Absolutely nothing about horoscopes or astrological signs. In fact, the word "astrology" is never used. The description even makes it sound like NASA is somehow involved with this, which makes it even more embarrassing. Now I know my grammar, spelling, etc. is never perfect but I guess this is why iPhone developers are usually not English majors. Your post made me giggle. The guy's using the NASA icon, which is only asking for trouble. 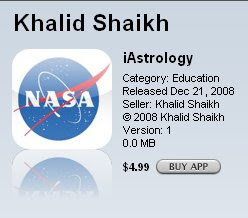 iAstronomy would have been a much better name for his app, but Khalid probably saw the word "astrology" first. I'm glad someone found it funny. :) I really hope though that this is renamed as iAstronomy.